IPL Medical Therapies – What is it? IPL, or Intense Pulsed Light is a long-term solution for unwanted hair. However, did you know it’s also extremely effective at treating a number of skin concerns? If you’re suffering from acne, thread veins or pigmentation, read on because IPL may be the solution you’re looking for. IPL works by filtering light, which means that only certain wavelengths of light will reach the skin. This is what makes IPL medical therapies able to treat a variety of skin concerns, because after filtering, the remaining light works on specific skin structures, achieving the desired results. Melanin in the hairs absorbs light during permanent hair reduction. This converts to heat, which damages the hair follicle and leaves it unable to support future hair growth. Many people are left feeling lost after unsuccessfully trying an array of creams and lotions to treat acne. IPL is a reliable option for people with acne and works in three different ways. The first is that it destroys bacteria on the skin. Whilst the underlying causes of acne vary from person to person, the cysts and blemishes themselves cannot happen without an influx of acne-causing bacteria. By destroying these bacteria, IPL removes one of the main culprits of acne. The second way that IPL targets acne is that it prevents the over-production of sebum. The acne-causing bacteria feed on the sebum, and the sebum itself is what gets trapped in the pores to cause spots, so by reducing the amount of sebum being produced, it becomes more difficult for spots to form. Finally, IPL dramatically reduces inflammation and stimulates collagen production, which means that red, angry spots are minimised and scarring is reduced, for a greatly improved skin texture. 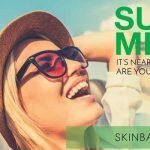 Treat thread veins, rosacea and cherry angiomas with IPL using SkinBase medical therapies. Small blood vessels trapped near the surface of the skin are the cause of these skin issues and can have a really negative effect on body confidence. SkinBase IPL targets these issues by causing controlled damage to the blood vessels, which stimulates the body’s healing responses. When the body identifies the damaged vessels, it will naturally remove them, revealing healthy, flawless skin. Pigmentation from sun damage can take up to 20 years to appear, which means even if we start protecting skin now, we still have to deal with the damage done years ago. IPL is a great way of removing unwanted pigmentation; it breaks down the excess pigment in the skin, which stimulates the body’s healing response. This healing response removes the damaged pigment, leaving behind even-toned skin. What are the other benefits of IPL? IPL is a non-invasive and non-surgical treatment. There’s no downtime either, which means you can go straight back to your day without needing to recover. IPL also stimulates collagen production in the skin, which reduces wrinkles and leaves the skin looking more youthful and fresh. SkinBase’s system uniquely uses a cooling handset to ‘anesthetise’ the area ensuring the most comfortable treatment possible. Contact us to find your nearest therapist. Spider veins – Can we treat them? Looking to improve blemish-prone skin before your big day? SkinBase™ is the leading microdermabrasion treatment. With over 2,000 accredited salons and spas in the UK & Ireland, there’s bound to be a salon near you.